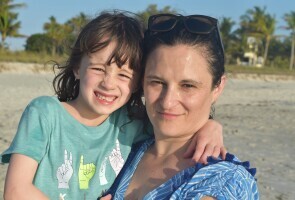 Breakouts aren't just for teens, which is why this acne-afflicted mother was the perfect candidate to try out a new device that uses light therapy to help make pimples heal faster. hen it comes to breakouts, I’ve been on the lucky side. Mine tend to be confined to certain areas (I'm looking at you, chin and nose), and only flare up during certain times of the month. As a result, I don’t use many anti-acne washes or other full-coverage products, since they tend to overly dry out the rest of my face. Plus, as a working mother of two, I don’t have a lot of time to apply masks that take a while to work. 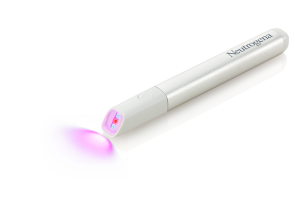 So when I heard that Neutrogena’s new Light Therapy Acne Spot Treatment can help people with mild to moderate inflammatory acne—and that you can aim it only at your problem areas, for just a few minutes a day—I was first in line to test it out. After all, light therapy is backed by solid science. “The device emits two kinds of LED light: red and blue,” explains Ali Fassih Ali FassihResearch Manager, Research & Development, Johnson & Johnson Consumer Inc., Research Manager, Research & Development, Johnson & Johnson Consumer Inc. Blue light works to kill acne-causing bacteria, and the red light helps reduce inflammation, which is what makes zits look so angry and inflamed. Thanks to the new spot treatment, you simply hover the tip of the lightweight pen-sized device over a trouble spot for two minutes, three times a day, to speed up healing. With a pimple on my nose and more flare-ups brewing, I gave the gadget a spin, starting on a rainy Monday morning. Although I did my first treatment while enjoying my morning coffee, I totally could have done it in a sleepy, pre-caffeinated haze. Simply press the button on the device, and it turns on with a beep. I positioned the angled head right over the giant, angry pimple beside my left nostril. There was only the faintest hint of warmth from the light on my skin. After two minutes, there was a quick double beep and the light went off. I’d barely even drained my mug yet. At lunchtime, I picked it up again and brought it to my desk to scan the headlines—and treat my pimple. Later that night, before watching some TV, I grabbed the device and some pretzels and headed for the couch. While I fast-forwarded through the commercials, I zipped through my final treatment. I recently bought a fancy electric toothbrush, and this morning, while I gave it a whirl, I decided to also do my acne treatment. Both devices are timed to work for two minutes. Yes, I may have looked a bit nutty with a buzzing toothbrush in my mouth and my LED-outfitted device pointing at my nose, but, hey, I call it efficiency! I did another lunchtime treatment, and then, at bedtime, another dental and dermal combo, feeling very pleased with my new healthy ritual. Wow! I woke up this morning, and to my delight, what had been a Rudolph-like spot had faded from bright red to a faint pink, and had shrunk in size. Plus, it no longer hurt to touch. Unfortunately, I could now feel (and see) a new pimple emerging on my chin, so I decided to treat both areas this morning—for a total of just four minutes—and then two more times throughout the day. It’s funny: I can barely remember to take my vitamins every day, but keeping this slim, sleek device next to my laptop is like my own personal reminder to stop for some self-care. Because I could do other things while I used the device—talk on the phone, write, even eat—there was no excuse not to. Had I been out and about most of the day, I could have even snuck into a bathroom for a treatment! Ha! Not quite! It was, however, a teachable moment: I explained to my very petite daughter how it worked—and that small things can also be mighty. Meanwhile, my flare-ups were diminishing under the lights—both my nose and chin spots have responded fantastically to the thrice-daily treatments. It’s funny: I can barely remember to take my vitamins every day, but keeping this slim, sleek device next to my laptop is like my own personal reminder to stop for some self-care. And knowing I’m on the light therapy treatment plan has also kept me from picking at my spots. I also love that rather than glop acne-fighting product onto the area, this was a totally neat way to accomplish the same result. As I come to the end of my test drive, my pimples are barely noticeable, and I don’t see or feel anything new on the horizon. And I don’t have any of the flaking that I typically get when my pimples have been treated with a topical product, which is awesome. Having seen how easy it is to use and how effective it is, I’ll be keeping this device in my bathroom drawer—where it can hang out next to my electric toothbrush.